Virginia Beach is one of the main places that I fish in Virginia. I fish a lot off of the piers because beach access is limited in this area. 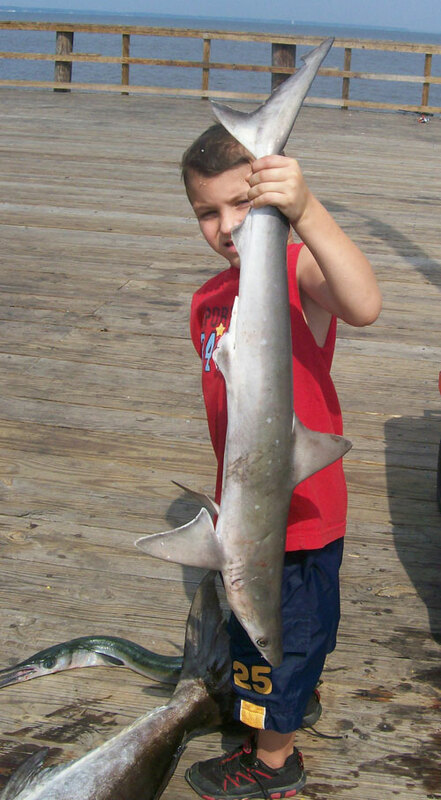 I fished Virgnia Beach Fishing Pier in August of 2008 and it was very productive for monster black tip sharks. It should be mentioned that shark fishing is not permitted off of Virginia Beach Pier, but you can’t help what bites your bait. We landed about 30 out of 40 blacktips. The largest was about 6′ but I didn’t have the equipment to weigh the fish, but I am sure it would have broke the state record. The best fishing spot in Virginia Beach is Little Island Fishing Pier, known as Sandbridge Pier. You have plenty of beach access and that is where the big boys run. Off of Sandbridge beach I would use at least a Shimano 30w LRS which holds 580 yards of 50 lb. mono. and a heavy 5’5″-6′ rod. The best bait that I have used in Virginia beach is live or chunked bluefish and spanish mackeral used the same way. Virginia beach is limited on sandbars in this area but Sandbridge is located on the southern point of Va. beach which is deep water and very swift rip current and sharks love that! July 26th of 2008, I hooked up on a 65lb. 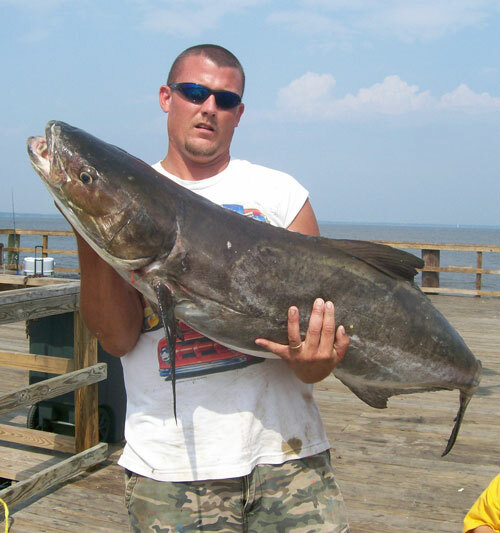 Cobia off of Sandbridge pier while penn rigging. The same day, I hooked up on about a 40lb. King Mackerel while penn rigging. The reason I say about 40lbs. is because while reeling the fish to the pier it exploded out of the water, and could not figure out why. Well needless to say, when I got it to the pier, I only had half of a fish and the one half was 20lbs. It was about a 61/2 ft. bull shark that cut this fish in half. All in all, Sandbridge is one of the best places that I have ever fished. Does anyone know of any reputable VA shark fishing charters? That pic is at colonial beach VA he caught that off of sandbridge i was with him when he caught it but brought it back home to show a few people..
To Josh. Figuring out what type of bait to use is the easy part. The equipment rods/reels, lines, and hooks can be the more complicated. All you really need is any piece of cut fish and you are in business.